She is somewhat of a brief footnote in history, often overlooked by the more celebrated members of her family. Many only know her as the daughter of England's Queen Victoria or as the mother of Russia�s Tsaritsa Alexandra. 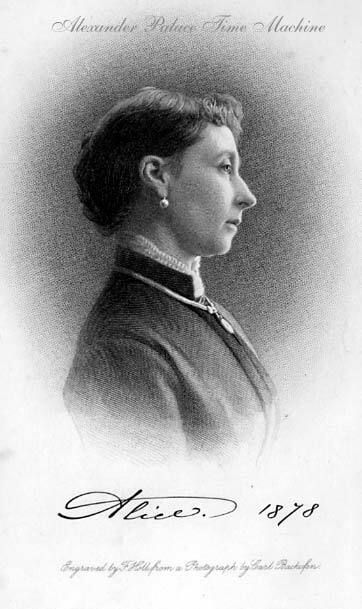 However Alice, the Grand Duchess of Hesse-Darmstadt, was a unique individual in her own right. Alice Maud Mary was born in the early morning hours of April 25th, 1843. According to a journal entry Queen Victoria wrote a few weeks after Alice's birth, the baby's two older siblings, Vicky and Bertie, happily welcomed their little sister into the family. Luckily neither Victoria nor her husband Prince Albert was upset over the fact that this third child was a second girl. The Queen appeared proud of the newborn, writing in her journal of her belief that Alice would become "the beauty of the family." Alice had a typical royal upbringing that consisted of nannies and tutors. Common of royalty, contact with her parents was somewhat limited and her siblings were her best friends. She was a special companion to her brother Bertie, and the two remained close their entire lives. Alice's relationship with her older sister Vicky was also friendly, and as little girls they were often caught in some kind of mischief together. One time the sisters went for a walk through the palace and encountered a servant polishing a black grate. The children walked up to the young woman and kindly offered to help, but before the worker could accept or refuse the offer, Vicky and Alice grabbed the brushes and applied them to the servant's face and clothing. The little girls unsuccessfully tried to keep from laughing, and the worker, resembling a chimneysweeper, darted from the room. As Alice grew from a happy girl of artistic talent and into a serious-minded young woman, she proved to be a loyal and reliable member of her family. This commitment was evident when tragedy befell her home in December 1861. That winter, her father fell seriously ill with typhoid fever. Alice, now 18 years old, devoted her entire time to nursing her father in order to allow the Queen to attend to the business of the monarchy. Everything in Alice's life was put on hold, and she spent endless days and nights reading to her father and trying to ease his pain. However Prince Albert could not fight the illness, despite Alice's constant attention, and death snatched him during the late hours of December 14, 1861. 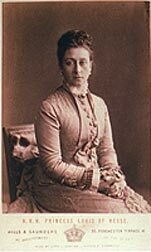 The Queen, along with the rest of her family, were still in mourning when Alice married Louis, the grand duke of Hesse-Darmstadt seven months after her father's death. Their union produced seven children: Victoria, Ella, Irene, Ernst, Friedrich (called "Frittie" by his family, he died tragically when he fell from a window in 1873), Alix and May. Alice's disappointment in her marriage did not stop her from taking an interest in her husband's subjects, however. Eventually the Grand Duchess started to pay close attention to the social concerns of the lower classes. She would often visit the homes of the poorest families, many times incognito, in order to learn about their living standards and how she could help improve what she witnessed. Alice once wrote to her mother about the visits, stating she felt the need of doing the little good she was capable of. Alice's desire for helping others was not limited to the poor, for the Grand Duchess also found a purpose in aiding wounded soldiers. She had developed a great interest in nursing and befriended the infamous Florence Nightingale. It was this interest that caused Alice to take an active role during the second of Bismarck's wars, which occurred in 1866. Her gender limited Alice in what she could do; however she did what was allowed, which included making bandages for the wounded. Eventually the war ended though Alice's commitment to nursing did not. She started visiting hospital wards on a daily basis, often bringing her children along. In November of 1878, tragedy struck Alice's home. Her eldest daughter Victoria came down with diphtheria, and the girl's fever was extremely high. Four days later, Alice sent her mother a telegram stating another daughter, Alix, had also contacted the disease, and it appeared the child would die. Not soon after, May also became ill. Eventually all the children with the exception of Ella were infected with diphtheria. As it turned out, all but little May pulled through. The disease had resulted in a painful choking death for the little girl. Alice kept the news of May's death a secret from the others for as long as she could. Eventually the children started to question their mother about May's absence, and she finally confessed that their sister was dead. Ernie, still recovering from the illness, was extremely grieved. In an attempt to comfort him, Alice kissed the boy, and she contacted diphtheria as a result of this action. Weak from sleepless nights of nursing her family through the ordeal, Alice had no strength left to fight her illness. On December 14th, the 17th anniversary of her father's death, she passed away. She was only 35. Alice's attempts to improve the lives of the most humble, as well as her devotion to the sick and injured, speaks volumes of how far ahead she was of her time. Despite this, she is somewhat of a faded memory, caught in between a celebrated queen and a doomed tsaritsa.